I have been involved in audio recording since a teenager. At that time, and since, I have designed and built my own audio equipment, including loudspeakers, microphones, amplifiers, and an analog tape recorder. I have been active in professional audio since 1969, when I joined EMI’s Abbey Road Studios as a recording engineer and was engaged in recording music of all genres. Since leaving Abbey Road in 1979, I have concentrated on producing recordings of classical music. 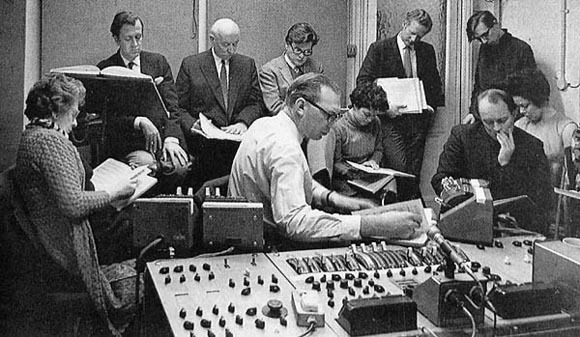 Listening to takes at an EMI recording session for Vaughan Williams' Pilgrim's Progress in Kingsway Hall, December 1970. L to R, foreground: Ursula Vaughan Williams, John Noble, John Alldis, Sheila Armstrong; background: Christopher Bishop, Sir Adrian Boult, Ian Partridge, Gloria Jennings, Christopher Parker, David Pickett. (Photo credit: Godfrey McDominic/EMI).